Maruyama Okyo's Cranes, 1772, An'ei period (1772-1780). 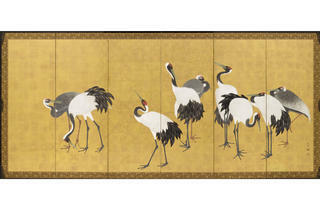 Pair of six-panel screens; ink, color and gold leaf on paper. Gift of Camilla Chandler Frost in honor of Robert T. Singer. Photograph courtesy LACMA. 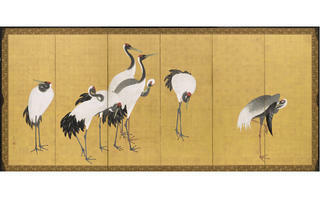 Crop: Maruyama Okyo's Cranes, 1772, An'ei period (1772-1780). Pair of six-panel screens; ink, color and gold leaf on paper. Gift of Camilla Chandler Frost in honor of Robert T. Singer. Photograph courtesy LACMA. The crane, the national bird of Japan and a symbol of good fortune and long life, is a complex creature that mates for life and continues to perform a ritualistic mating dance with its partner long past coupling. (We should all be so lucky.) The red-crowned crane, known for it's blush-red cap, is a rare vision as only 2,200 or so are still in existence. 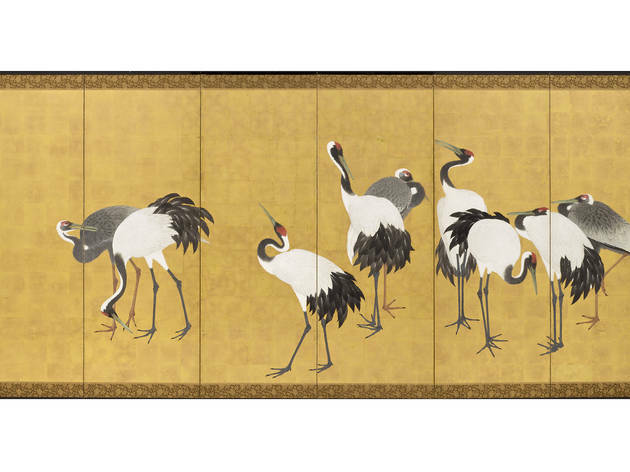 Now, you can see 12 glorious red-crowned cranes (and five white-naped ones) in lifelike glory, as depicted in Japanese artist Maruyama Okyo's (1733-1795) Cranes, an intricate pair of gilded screens on display at LACMA's Pavilion for Japanese Art. Painted in 1772—when the revered Japanese artist still had keen eyesight and meticulous brush strokes—the pair of six-panel screens were quickly preserved in elaborate wooden boxes and secreted away. In 1926, the Harihan family purchased them (only the second owner) for an astounding price of 16,800 Yen (about $16 million today). This exhibition represents only the third time the screens have been publicly displayed in their 240-year history—thanks to the dogged detective work of LACMA curator Robert T. Singer, who spent 15 years hunting down the owner of Okyo's Cranes and obtaining a nearly-impossible to acquire Japanese government import license for their shipment to LACMA. (Previously, they showed for four weeks in 1996 at the Kyoto University Museum of Art; four weeks in 2004 at Osaka Museum of Art; and were subject to at least two private displays to two separate Japanese emperors in the late '50s.) 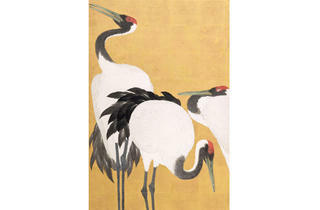 "There's nothing else like them in Japanese art," Singer recently said of Okyo's Cranes. "To me, they are unique. And I am not someone who uses that word lightly." Revolutionary for their time, and copied by many artists afterward, the cranes appear to exist on an abstract foundation, with no ground plane, which was an uncommon technique. No water, streams or rocks were painted into the scenery, just 17 nearly life-size cranes resting, sleeping, flirting and, in some cases, bowing toward the gap between the two screens. The feathers are rich and textured. The gold leaf shines as if being viewed by candleight. The brackets at the corners of the frames are a delicate, handcarved marvel of strength and construction. In late 2011, Singer displayed the screens for longtime LACMA benefactor and trustee Camilla Chandler Frost for the first time. An avid birder who counts the red crane among her favorites, Frost funded the acquisition of Okyo's Cranes by LACMA, in honor of Singer. 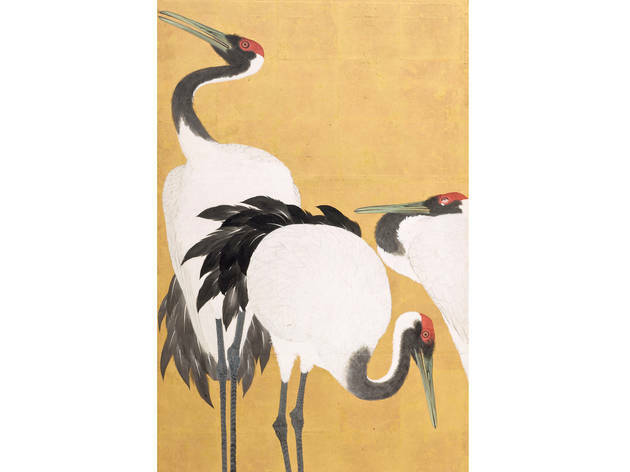 The Cranes are, according to Singer, "The finest pair of screens to ever leave Japan in the 440-year history of Western contact with Japan." 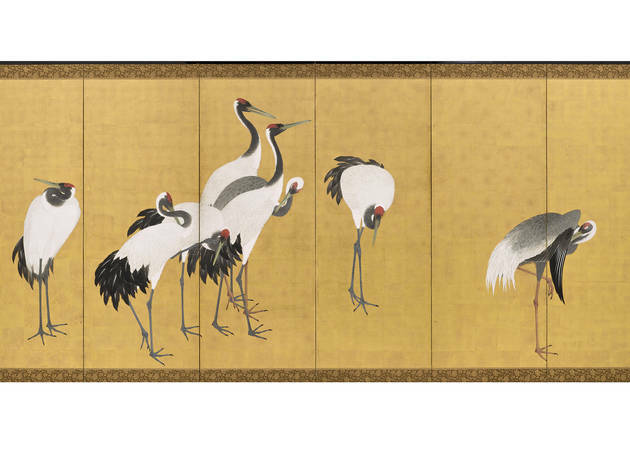 Okyo's Cranes opens Saturday Jan 19 and will be on view at the top floor of the East wing of LACMA's Pavilion for Japanese Art.